Microfiber tip works exactly like your finger but won't leave an annoying fingerprint or other dirt on the screen. Never scratches the device screen. iSOUL ballpoint pen ink flows smoothly. Only the products with our logo of "ISOUL" are original authentic, otherwise without the logo of "ISOUL" are all counterfeits without our authority. 18 months Warranty. If for any reasons you are not satisfied with our service or product, please contact us first. One end contains the stylus that works with capacitive touch screens, like iPhones, iPads, Androids, and most other modern tablets and phones; Twist pen body to extend the ballpoint pen for whatever else you want to write. 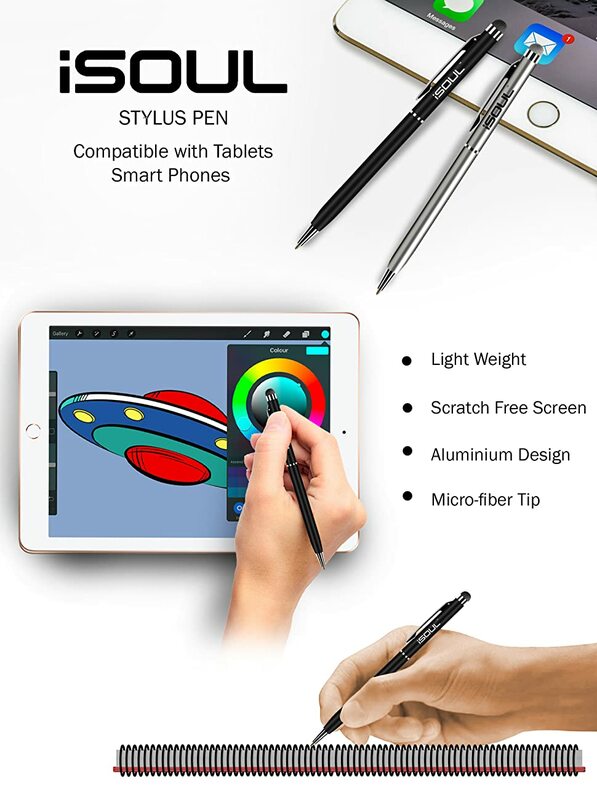 Use a stylus pen to prevent scratches on the screen of your mobile & Tablet and Compatible with Tablet PC, Smartphones, iPad, iPhone, iPod or any other capacitive touchscreen. Size Approx. 5.6" (14.1 cm).